Well, I have become a pressure cooker convert. Like thousands of others, I jumped on the Prime Day bandwagon and ended up with an Instant Pot (IP). I was amazed by the hard-boiled eggs, with shells that slipped off effortlessly in one piece. I fell in love with the 7-inch cheesecake, perfectly creamy and done in 40 minutes. Rice has never been so easy. Spaghetti squash, so quick. I could go on…it’s a great appliance! Since we’re in the middle of CSA season (Community Supported Agriculture), I’m finding ways to use the IP for fresh vegetables. However when I looked for recipes for fresh peas, it seemed most recipes were geared towards dried peas. I took a gamble and just winged it, and got a winner! Here it is! Use about any variety of peas you’d like. I think the following would all be good: black-eyed, pink-eyed, purple hulls, field peas, crowder peas. These peas are only mildly spicy, likely due to the sweetness of oven-roasted tomatoes. If you want to feel more heat, add more Creole seasoning or a little cayenne pepper or hot sauce. With 5 minutes of cook time, the peas are tender, but not “mushy tender”. Add 1 minute to the cook time if you like a really soft pea. If you like stewed okra, it would be a great addition. Throw in a few pods. You could also cook this on the stove top – just increase the cooking time and keep an eye on the level of liquid so it doesn’t dry out. To make your own oven-roasted tomatoes and Creole seasoning, follow the links posted in the ingredients. Set IP for Saute function: Heat a small glurg of olive oil in the Instant pot. Add the chopped bacon and cook until fat is rendered and edges are getting crispy. Add the chopped onion and saute until soft. Pour in chicken broth. Add peas, tomatoes, and seasonings. Stir well and bring to a boil. Turn saute function off. Place lid on Instant Pot and make sure venting knob is closed. Press “Manual” and adjust time to 5 minutes (high pressure). When cook time is done, allow a full natural pressure release (about 15 minutes). Open pot and stir peas. Adjust seasoning to taste, then enjoy! 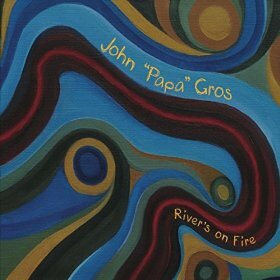 What better to go with Creole Peas than some New Orleans funk, by way of John Papa Gros and River’s On Fire . The NOLA keyboardist, along with mainstay funk guitarist Brian Stoltz (Meters, Nevilles) are smokin’ with his new album, with uptempo funk, slow ballads, and more than a taste of Longhair…Professor that is! Creole Peas is a great addition to be added in tonight’s menu. I think I’ll make it now. My instant pot is ready! This entry was posted on August 13, 2016 by She cooks...He cleans in Instant Pot, Side dishes and tagged bacon, black-eyed, Creole, crowder, easy, fast, field, fresh, Instant Pot, oven roasted, peas, pink-eyed, pressure cooker, purple hulled, quick, recipes, side dish, spicy, tomatoes.